Repost of my blog post over at The Pocket Source for their group "Stories of Me". Are you a member?? GO. CHECK. IT. OUT. You won't be disappointed. 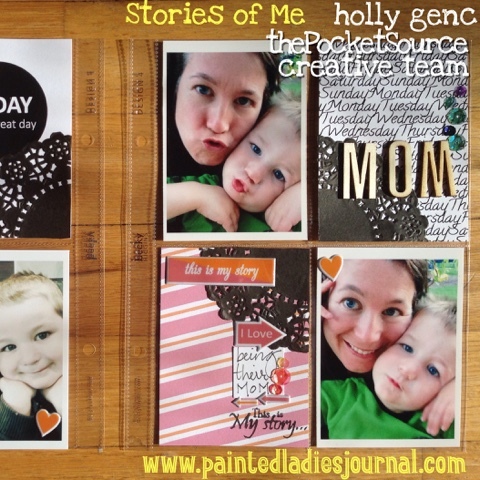 Ok, Ok, I know it's June and we are on to the next theme for "Stories of Me", but I so wanted to do the Mother Theme layout and, though a little late, here I am. I really loved using the Studio 29 Design's Take 10 Kit from January 2015 (still a few left, only $2.50 wow). It is just perfect for the "selfie scrapbook" and "stories of me" themes going on lately in the scrapbook world. This kit has the perfect stamp set for this theme.